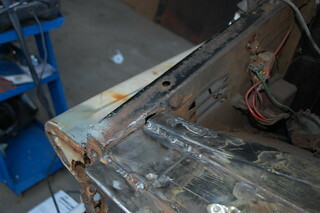 As I was tearing down the front end, I found a screw up in my prior welding work. 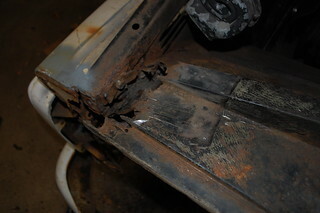 I didn’t notice at the time that the heat of my welding had warped the second patch downwards on the passenger side. 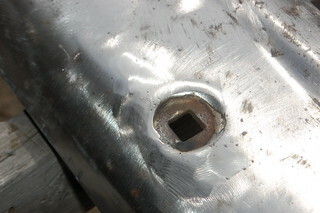 It is significant enough that the bolt hole for the rad support would be too close to the top to actually get a bolt in. 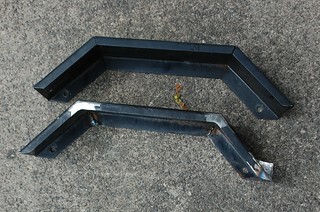 The fender flange also has a similar bend. 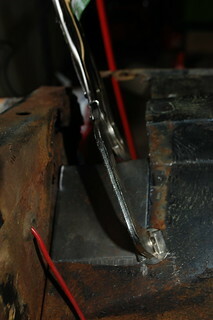 I ground & cut the welds along the side, bent the whole thing upwards, and tacked it in the right place. 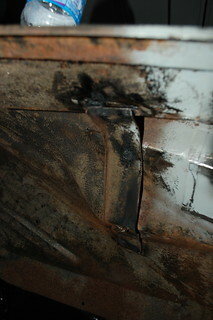 There is now a gap along that edge, so re-welding it was extra fun. Much closer now. 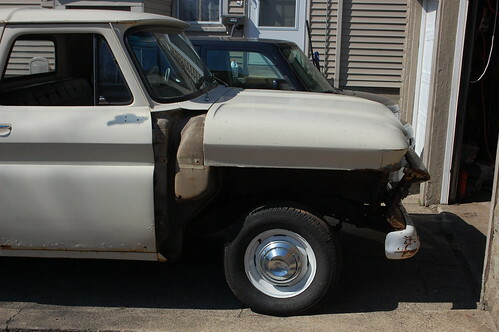 The outer corner is still a bit low, but I should be able to fix that with some hammer work once the inner fender comes off. 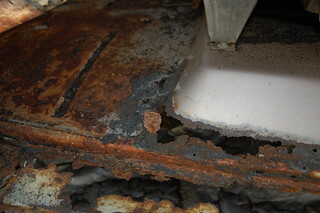 In the continuing adventures of my rotted out ’64 Chevy truck. 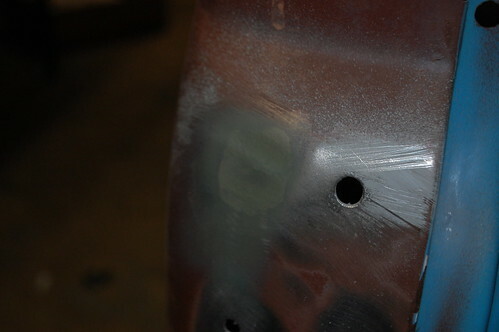 Today’s plan was to get the front of the passenger inner fender repaired enough that I no longer need the core-support in for reference. 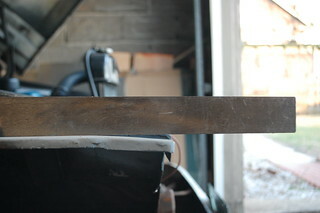 As a reminder, this is what I started with. 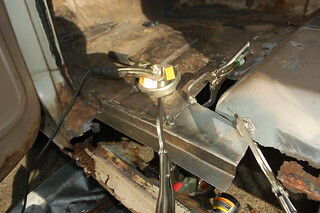 Third & fourth patches went in. 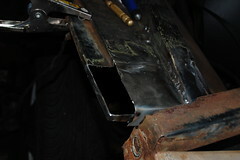 Then I started fabricating the end of the fender mounting flange. 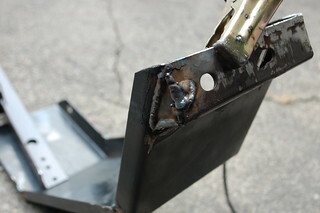 The corner all welded up. 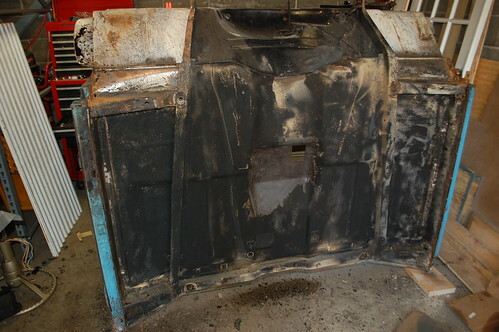 As before, once the radiator support comes off I’ll be finishing up the grinding and re-doing some of the crappier welds as I’ll be able to reach them easier. 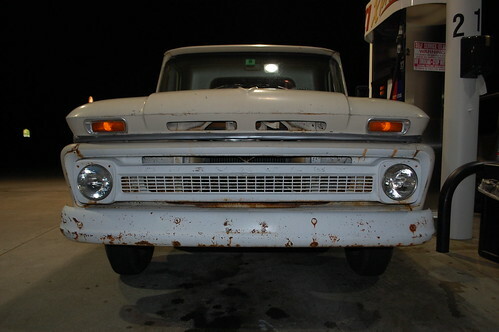 This year’s project with the ’64 pickup is to get the rust fixed so I can get some paint on it. 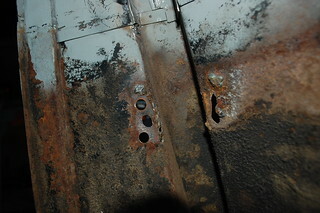 To that end, the front end was stripped down so I can start start in on the incredibly crusty mess. 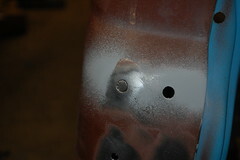 The first target is the inner fenders. 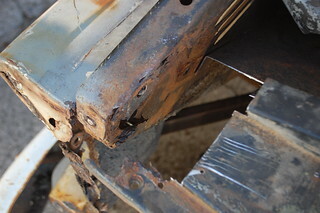 The front edge has a bracket on the underside from the factory that traps muck thrown up by the tires and always rusts out. 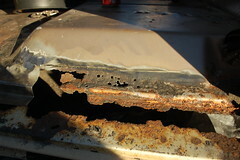 The ones on this truck were previously “fixed” with super thin sheet metal pop-riveted on and covered in roofing tar. 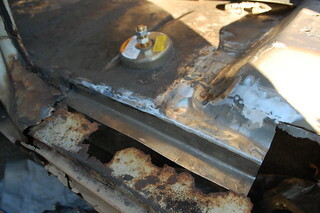 This worked so well the patches had rusted through as well. 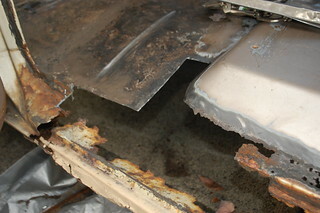 I started in on the driver’s side by cutting out the rot until I reached good metal. 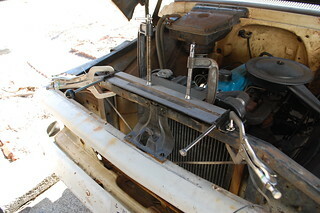 I’m doing this with the radiator support still in place so I can use it as a guideline to make sure everything lines up. 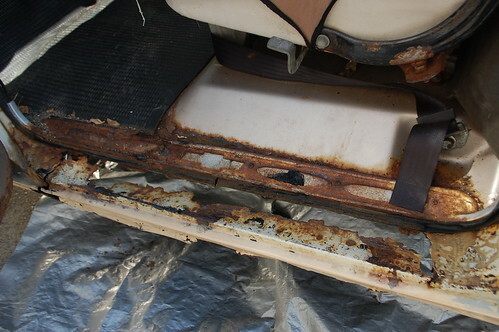 Once I have both sides done the rad support will come out so I can finish the patches & so I can fix the massive rot on the support. 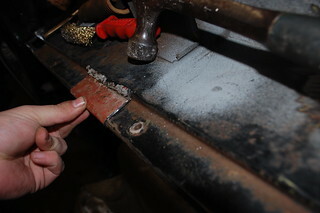 I set up my metal bender in a convenient location, then it was just the tedious process of cutting, bending & fitting patches. 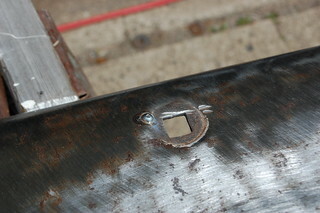 I am using 18ga steel for strength, so my flanging tool doesn’t make the flange deep enough to be flush. 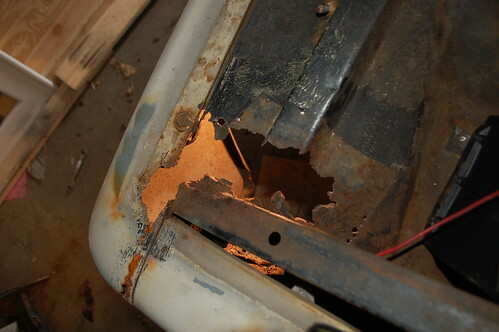 I’m not too worried as this area is not visible with the hood down. 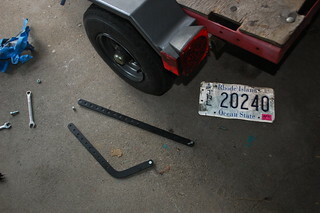 Then two more patches to replace the fender mounting flange. 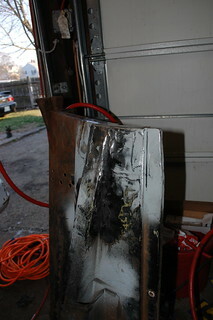 It is far from perfect, and there is a lot of grinding still to do(as well as re-doing some of the uglier welds), but it seems solid. 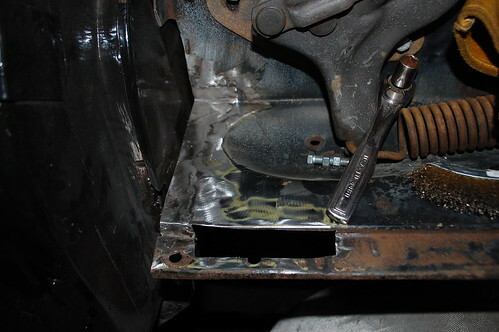 Once the radiator support is out I will need to add one more patch to the front edge of the raised portion, and drill out the various bolt holes. 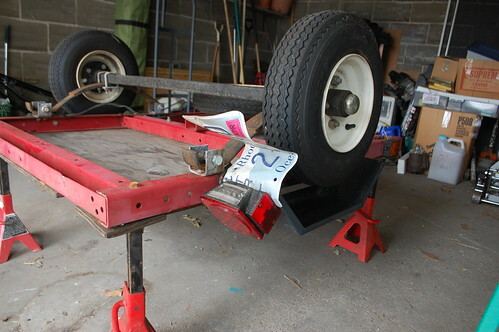 The wee trailer has served me well for over two years no matter what I threw at it, and despite a lot of abuse it just kept going. 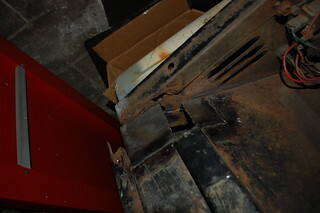 However it was due for a bit of maintenance, so I decided to fix several issues at once. 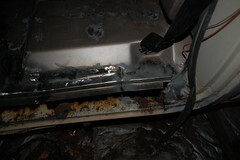 As you can see in the pic above(the trailer is upside down in that shot) the license plate is utterly mangled from getting caught every time I tip the trailer on end to store it. 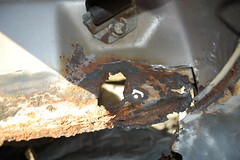 And this is after the original bracket broke off. 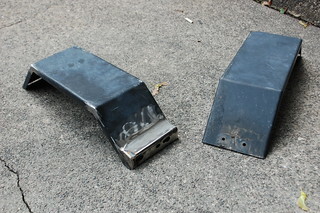 Also the tail lights were moved to the fenders after those brackets broke, but they point to far up and aren’t easy for other drivers to see. 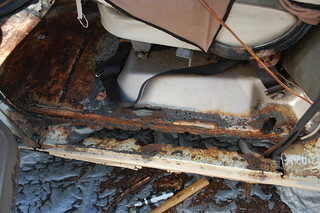 So While I was greasing & adjusting the wheel bearings I decided to fix those once and for all. 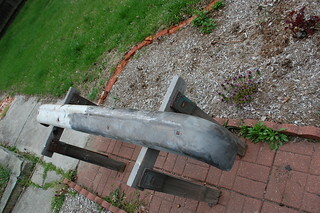 As the house is eating most of my money, I decided to see if I could do this with only stuff I had around. 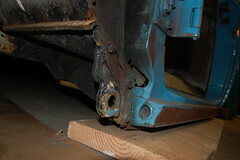 So I dug out a now extra bed frame, and cut a piece off to serve as the new tail light bracket. 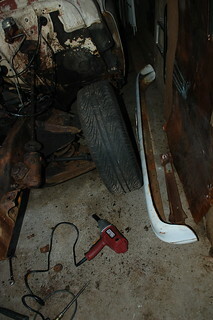 I tacked it to the bottom of the fender. 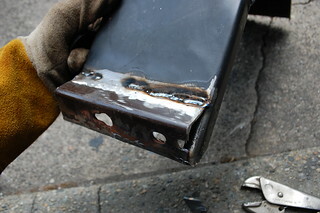 Then I finished off the welds. 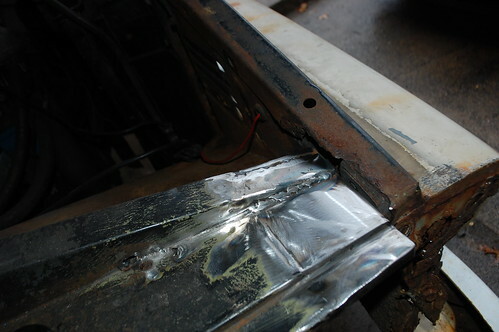 After grinding the welds down I added a few more tacks to fill any low spots and ground that smooth, continuing until it looked decently smooth. 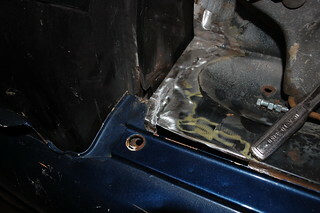 To save myself a lot of effort, I cut the bed frame so I could use the existing hole as places to bolt the tail light. 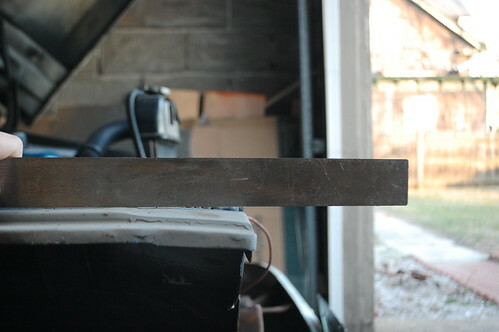 On one side this meant another hole was on the edge of the cut, leaving this small cutout. 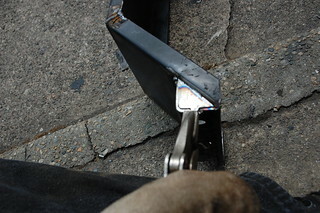 I wanted to cap the visible end of the bracket to make everything cleaner, so on this side I added a tab to the triangular filler piece. 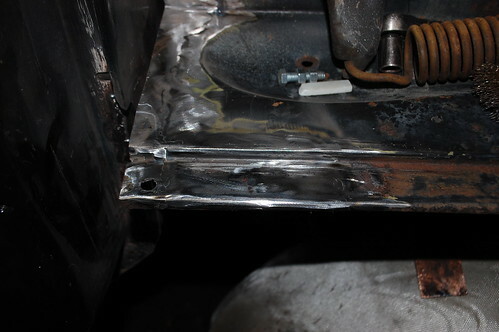 This is the filler fitted into place, don’t take this image as a sign that I am an amazing fabricator, I was surprised as hell that I managed to get it to fit this well. 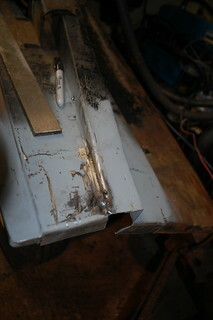 Then welded the cap in place. 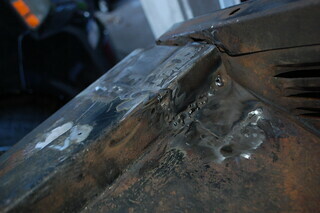 Once it was welded in I hammered over the tab and welded that in. 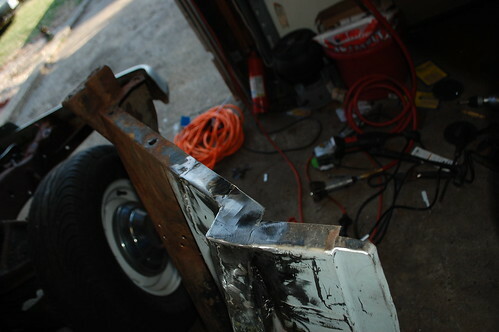 One bracket built, compared to the unmodified fender. 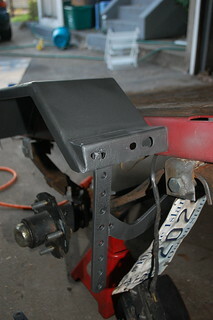 Once the brackets were attached, I cut the fender out behind the bracket so I can reach the bolt on the lights. 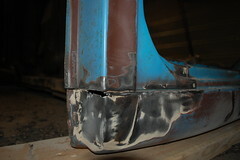 I also welded the seams on the fenders for strength, and to allow me to grind them smoother. 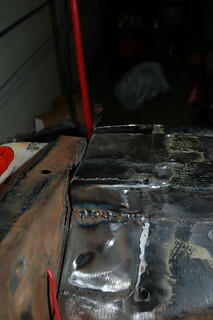 Also barely visible in this shot is that I smoothed the corners. 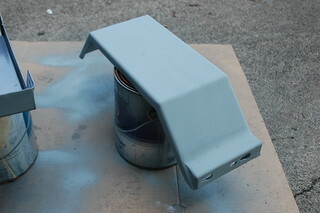 Fender with a coat of zinc primer. 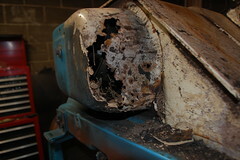 I didn’t worry about getting everything perfect as they are going to live a hard life anyway. 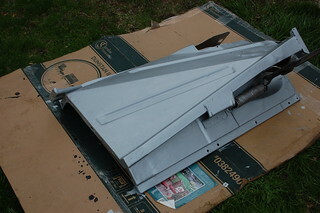 Also I was planning to use the hammered metal spray paint, which covers a lot of sins. 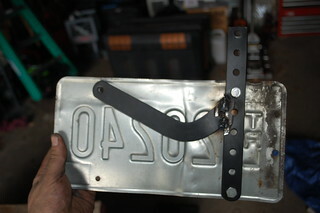 I also wanted to build a sturdier license plate bracket, hunting around I found these brackets from a dead garage door opener. 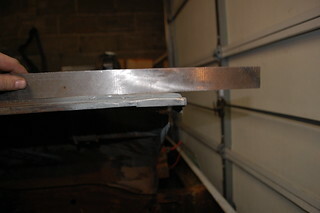 The curved one turned out to be perfect. 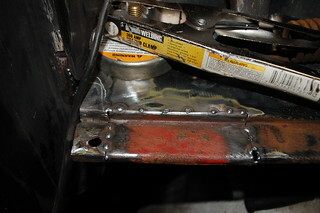 Installed on the trailer, and painted with hammered metal paint. 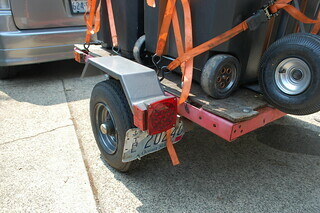 And the finished, re-assembled trailer. 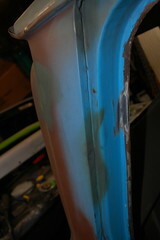 At some time soon I’ll need to replace the decking, at that point I’ll repaint the main frame. 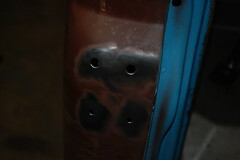 I also ground the rust off the rims and shot them with some leftover graphite paint from Box’s wheels. 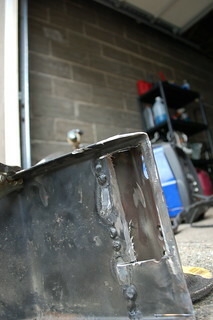 the manifold exhausting attempts to fix the exhaust manifold. 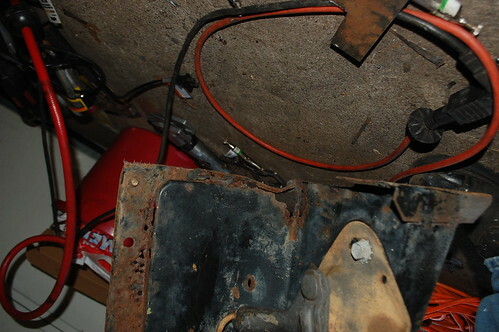 As I have said before, the exhaust manifold on the “new” engine was cracked, so I needed to pull it and swap the good manifold from the old engine. 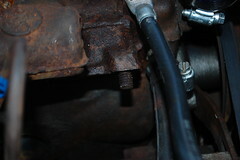 Ford sixes are notorious both for cracked manifolds and for the bolts rust-welding themselves to the head. 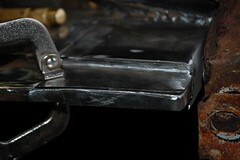 A fun combination. 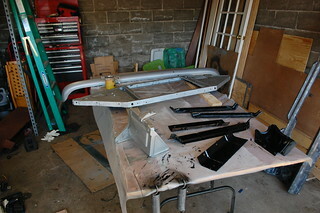 So in the days leading up I sprayed the bolts with PB Blaster and Freeze Off. 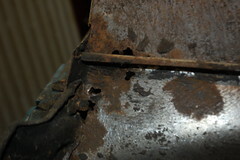 Once I started in I used a bolt extractor to get a grip on the badly rusted heads. 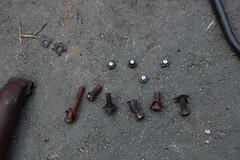 End result was six bolts actually coming loose, four snapped off bolt heads and one bolt who’s head stripped badly without shifting. 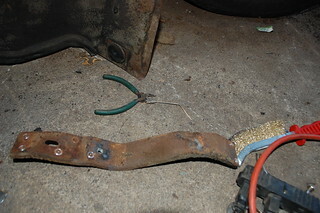 I spent the next while trying to shift the stubborn bolt, I tried the bolt extractor, vise-grips, welding a nut onto the head and probably a half-dozen other things without the slightest sign of movement. 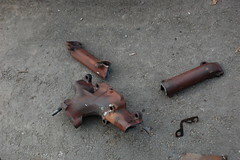 I finally gave up and cut the head off with an angle grinder, and pried the manifold off in pieces. 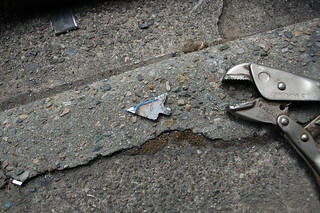 The places it snapped in the pic are not where the cracks were, but just the result of overly enthusiastic prying. 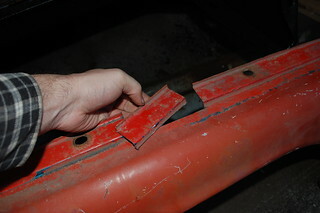 Fortunately I didn’t need this piece anymore. 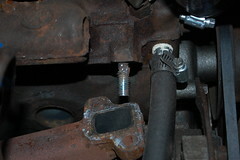 Frustratingly, the bolt that had given me so much hassle and wasted so much time, once the manifold was off it came out in moments with a pair of vise-grips. 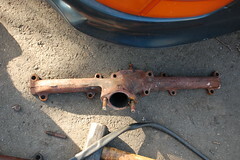 Once the manifold was off I still had the problem of the four bolts that had snapped off. 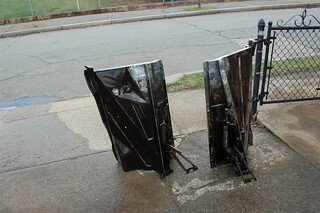 I was lucky in that they hadn’t snapped off flush, but I still couldn’t budget them. 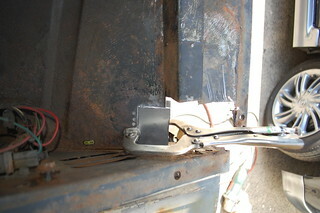 Vise grips would just chew them up, and attempts to heat or freeze them didn’t do a thing. 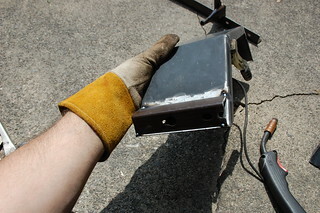 I even tried welding a nut to them and putting a wrench on it. All I did was snap the nut back off. 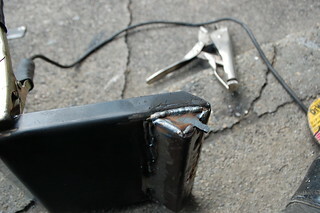 Finally I gave in and decided that if the bolt wanted to be a permanent part of the head, I would take advantage of that instead of fighting it. 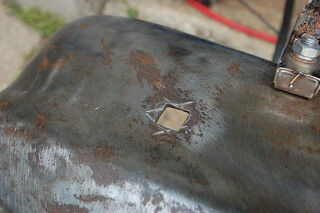 So I cut the bolt back about half way with an angle grinder to get a flat surface. 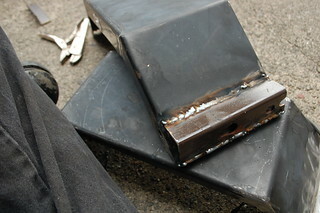 Next I cut the heads off some short bolts and chamfered the ends to give my weld someplace to bite. 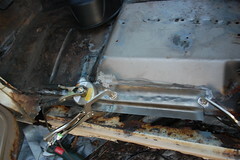 Then one by one I welded the new bolts to the old once, effectively creating a stud I could put a washer & nut on. 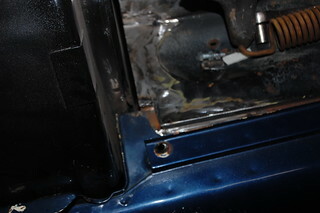 Because I was working down in the engine bay I had no good way to get the pieces aligned perfectly straight. 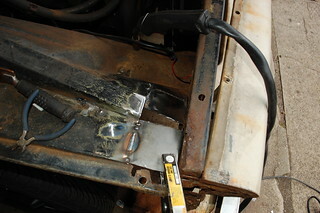 So after welding each one I had to grind the welds down and test fit the manifold. 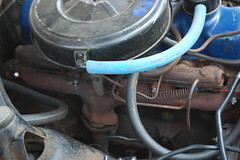 I was lucky in that they all ended up straight enough to allow the manifold to slide on and off easily. 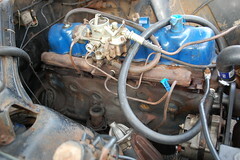 Add some stainless steel hardware & a new manifold gasket and the project was done.